Paper shredders are fast becoming more popular with businesses and individuals, as they provide a fast, efficient and affordable way to dispose of confidential information. Using a paper shredder provides protection against identity theft and other crimes. They’re also now easier to use than ever, with improved security and safety features. But before you go out and buy a shredder, it’s important to understand exactly what a paper shredder can do for you. Read on to find out four tips for choosing a paper shredder for your home or office. One of the most important things when choosing a paper shredder is to ensure the shred speed is adequate. The speed of the shredder you purchase will depend on whether you’re using the shredder at home or in an office. If you’re just using your shredder at home, a home shredder should meet your needs. Typically, home shredders are capable of shredding 5 to 12 sheets of paper within 2 to 8 minutes. However, if you have a large volume of paper to shred, such as office documents,it’s best to invest in a shredder with a faster shred speed that can operate for 45 minutes continuously. A heavy duty shredder with a faster speed will also be more likely to stand the test of time compared to a lower speed shredder. Before choosing a paper shredder, it’s essential to identify what you plan on using it for. This often depends on whether the shredder will be located at home or in a workplace environment. 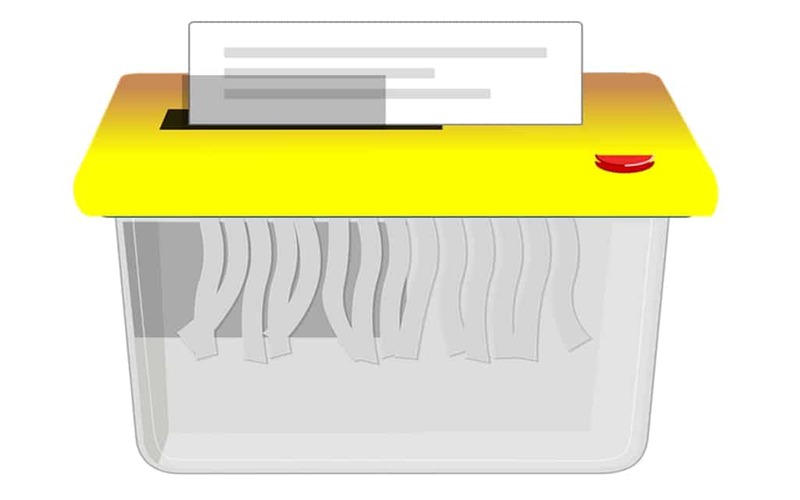 To determine your usage, figure out how many people will use the shredder and how often they’ll need to use it. Personal shredders are designed for 1 person, while small office shredders are for 1-5 daily users and large office can support 6-10 users. When buying a shredder, you must determine what you plan on using it for in order to get the best value for your money. When buying a paper shredder, you need to determine what page capacity you need. If you shred more than the occasional page, you’ll likely want the ability to feed a few sheets at a time. Without a multiple page capacity, you may need to unjam the shredder a lot. This can waste a lot of time and cause hassle as well as damage to the shredder. The bin capacity is also important to consider. It’s a good idea to get a shredder with a pull out bin, as this makes it much easier to remove and empty. Finally, when choosing a paper shredder, it’s important to consider machines that feature anti-jam technology. Whether you’re feeding one page or multiple documents into a shredder, there’s the potential for a paper jam to occur. Shredders that don’t jam frequently help to minimize any complications that may occur. They also reduce unnecessary frustration, making individuals more productive and content at work. Maximum paper shredder produces noise. Some moving parts inside this box produce noise when slicing the bundle of papers. It does not depends on the brand .If you spend some more money on it then you have a good chance to find out some machine that carries a noise controlling unit inside it.